In 1981, a young aviation-obsessed university student, New Zealander Glenn Martin, began working on his dream to invent the world’s first commercial jetpack. On Tuesday, the company he founded, Martin Aircraft, was valued at more than $100 million when it listed on the Australian Securities Exchange, after securing a cornerstone investment worth up to $50 million from Chinese aerospace group Kuang-Chi Science. “I always knew it would be a long road to develop a wearable jetpack. The United States military had thrown lots of cash at big companies in the 1950s and 1960s that failed to come up with anything practical, and here I was just a Kiwi bloke in a garage with a hobby,” Martin Jetpack inventor and company founder, Glenn Martin said. The Martin Jetpack runs on a V4 200 horsepower petrol engine that drives two ducted fans. It is able to fly for over 30 minutes at speeds up to 74km/h and altitudes of up to 1000 metres, carrying a commercial payload of up to 120 kiolgrams. First deliveries are now scheduled for the second-half of 2016, with basic versions set to retail from $US200,000 ($255,000). Customized versions for military or emergency services clients will carry a higher price tag. A slew of regulatory, licensing, and insurance hurdles will need to be overcome before the company’s vision for its jetpacks to become a common mode of transport for emergency services workers is realized. Mr Martin, a biochemist by trade, said he pursued a day job in sales and marketing in the early days of founding the company because “that’s where most inventors screw-up”. 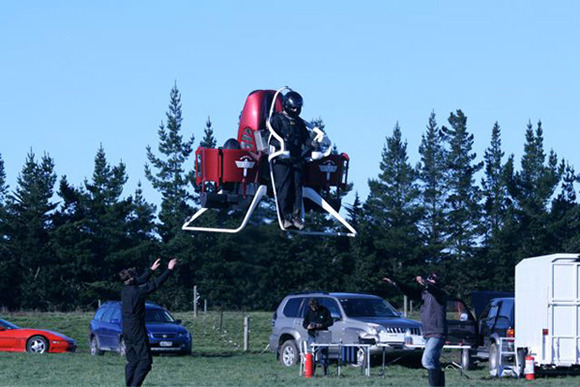 In 2004, a promotional video of an early prototype lifting his wife Vanessa off the ground caught the attention of Jenny Morrell, the founder and managing director of New Zealand venture capital firm No8 Ventures, who made an investment that today makes her firm Martin Aircraft’s second largest shareholder with 19 per cent. Vanessa Martin’s role in getting the company off the ground was vital in more ways than being a demonstration model. “For years Vanessa worked overtime shifts at night and on the weekends as a nurse to keep the money rolling in, so I could keep plugging away at research and development. When the children were in school she worked full-time while I was a stay-at-home Dad who built jetpacks in the shed, which I think our boys thought was quite cool,” Mr Martin said. When the market closed on Tuesday the shares were fetching 44¢, up 10 per cent from the 40¢ per share initial public offer price. Mr Martin said he was “delighted” with the result that saw shares belonging to a handful of family and friends, who were early backers, valued at between 10 to 20 times their original investment. The Martin family remain the third largest shareholders in the newly listed company with a 15.8 per cent stake valued at roughly $15.5 million. Peter Coker, a former Lockheed Martin executive, was recruited in 2013 as chief executive to lead the commercialization phase. Former head of New Zealand Trade and Investment, Jon Mayson is chairman of the board. Axstra Capital acted as lead adviser on the IPO that raised a total of $27 million. The deal was sealed in January when Chinese aerospace group Kuang-Chi Science agreed to buy $21 million worth of shares in exchange for a 23 per cent stake in the company. The Hong Kong-based investors have also committed to bring their total investment up to between $44 million and $50 million over the next 2½ years, through a mixture of equity and debt. Kuang-Chi Science chairman, Ruopeng Liu was introduced to Martin Jetpack when he accompanied Chinese President Xi Jinping on his visit to New Zealand in November. Mr Liu said the “shared attitude of disruptive technology” made for a good fit between the new joint venture partners. In its other ventures Kuang-Chi Science operates data centres out of large blimps, taking “cloud computing” to literal heights.